As most of you know, I'm inspired by all the beauty that surrounds me. All those pretty little everyday things are what stimulate me to design. From gorgeous magazine clippings to flowers blooming in my garden, these simple beauties are what have sparked my fabric collections. Once I'm done designing, I can't wait until the final production comes in and I have all my fabrics in hand to start making all sorts of goodies, from dresses and shirts, to handbags and quilts! This is the part that amazes me the most. My very own fabrics, that were created from all the beautiful inspiration surrounding me, have now become their own form of inspiration for you to create! Whenever I see a bundle of fabrics with a fascinating color story, my imagination starts working, thinking of quilts, table runners, clothing... just about anything! I just love the fact that inspiration is in the form of anything and everything. It just brings me great joy! 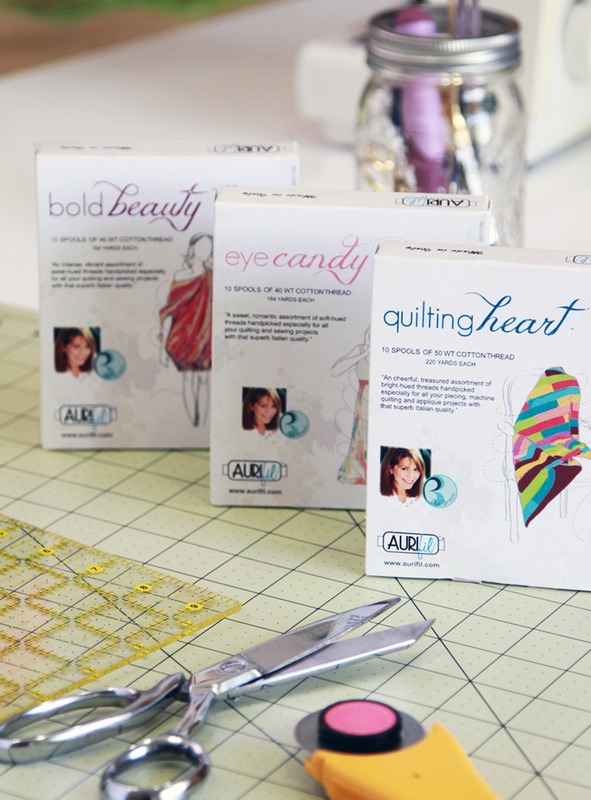 My sweet dears, this is the bundle that inspired the 'Bold Beauty' box set for Aurifil! Not only do I have a 12 spool set of this gorgeous array of colors, but now I have a new mini spool collection. This bundle inspired me to select my thread colors. What does this bundle inspire you to make? To enter the giveaway, leave a comment below with your answer to, "what does this bundle inspire you to make?" 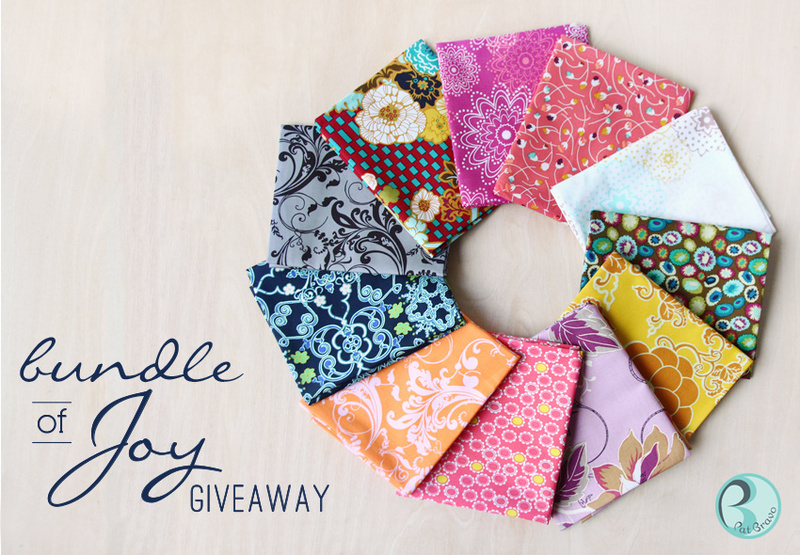 Two lucky winners will win this fat quarter bundle of joy! For a second chance to win you can enter on my FaceBook page. Contest ends Friday, the 13th, and winners will be announced Monday, the 16th. I believe those fabrics would look great in a bold and chunky modern quilt, something that would let each pattern stand out and be noticed. Lovely! As always thanks for the chance to win! This bundle would make a perfect Barcelona bag! Thanks for the give away! Beautiful bundle! I would either make a skirt for my daughter or a quilt. Thank you for the chance to win! New decorative pillows for my sofa! LOVE the pic with the matching thread...had to pin it to my inspiration board! BEAUTIFUL!!!! Thanks for the chance! This could make a very cute bag or purse. A quilt or matching dresses for some precious little nieces! I'm with Joyce. A gorgeous bag on which to practice QAYG with my new Aurifil thread. Or maybe two bags. Or three. Gorgeous line! I think I would make a skirt or a top with colorblocking for my daughter, because I don't think I could narrow it down to just one or two fabrics!!! A quilt with matching throw pillows! And probably a wallet if there's any fabrics left over! Bed cover for my daughter. These are absolutely her favorite colors. They inspire me to make a really bright modern summer quilt for my best friends daughter! I've been wanting to make some really bright and fun place mats! I could probably even make a matching runner. 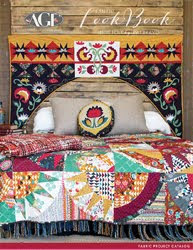 It inspires me to make a beautiful and eclectic quilt! They would be great in a quilt! Beautiful colors. Thanks for the chance. Definitely a quilt..maybe one for me this time! I see a new table runner - nice colors. My living room is all white, with black side tables and tan leather couches, I would love to make some gorgeous pillows to add some COLOR to my living room. These fabrics would definitely bring joy to the room! I would love to use these to sew a cute, quilted tote I just bought a pattern for! The bag has a band of pieced pinwheels around it, and the variation of colors would be so fun to use for something like that! :) Thanks! It inspired me to make a quilt for my own bed, finally =) These are my favorite colors and I would combine it with some favorites I have from the rock n romance collection. How Perfect! I see a beautiful runner using my new template set made with this gorgeous fabric! A nice big block quilt to snuggle under in the winter months ahead. And if there were any lefovers I'd make some patchwork strips to use in a nice tote bag. 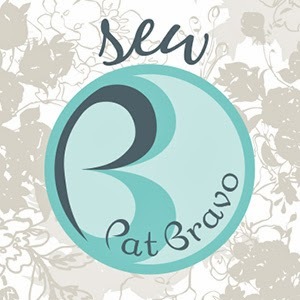 I love all your fabrics Pat! this bundle inspires me to make a long flowy skirt or a warm bright and bold quilt to cuddle up in while I read a book and drink coffee! Anna Marie Horner's Painted Portrait Blouse pattern - I actually had two of those in mind for the yoke, but this group is more colorful! This would make a beautiful throw for my big chair. You can never have enough throws to snuggle with while watching a show as a family. A flowy summer tunic, in many prints. Gorgeous bundle and thread collection! first I thought throw pillows for the couch but I am rethinking it would be great to work on some of Tula Pink's 100 modern blocks since I picked up the book this weekend. Thanks for the chance to win! Lovely work, thanks so much for this opportunity! Great giveaway! I would make a Dresden plate quilt with fussy cut flowers appliqued in the middle of each colorful Dresden block. I think I would make the background a light gray solid. Then I would do the flowers in each corner. I would send you photos. Thanks for the giveaway! I am seeing some covered corkboards! I have some corkboards that I have been wanting to cover w/ some gorgeous fabric to make pin boards for keys/mail/notes/etc and this would be PERFECT! Probably for me, it would be purses, totes, or tech cozies. The last time I sewed with your fabric, I made jewelry travel cases for my sister and two nieces. I would make a cushion for the bench in my bedroom! I think I would make travel bags. sigh...first of all, I love the colors of your fabrics! I'd probably try out quilting and make myself a lap quilt! Lovely fabrics as always. I think these would be lovely in a granny square quilt just in time for winter! Winter with color. It inspires me to make a cozy quilt! There's a log cabin design that I've been looking at that has bright colors on one half of the square and grays on the other half---I think I'd use them for that log cabin quilt. Gorgeous bundle of joy!!! I would be inspired to make some table runners and placemats ! Thanks for the chance! I would make a beautiful modern quilt using one of the many patterns I've collected. Pillows - quilted pillows, just not sure what pattern, yet! A patchy quilt for my own bed, and then some pincushions from the scraps (if there are any). I would love to make some patchwork throw pillows. I think I'd single out the pink, orange and navy for a bold quilt pattern. Wouldn't that be a pretty combo? I think wither a bag or a modern lap quilt. I might even use one or two of them in a modern Christmas stocking. Great bundle! I thought about my daughter when I saw the colors. She would love for me to make her a patchwork pillow. I would like to make a tote bag for me. It would have to be something for my mum, as that bundle of fabrics is just her! Probably a giant Star quilt to show off the patterns in the fabric! I just finished a quilted sweatshirt jacket that I love and would like to make another with your vibrant colors! I'd make a lap quilt in a pinwheel design for my living room redo! These inspire me to make more zipper pouches for my church's bazaar! OMG - I love all the colors! I'd love to turn these into a quilt. I'd have to find a pattern that would really showcase them! This bundle is gorgeous!!!! I want to make my grandbaby girl several "strip" peasant dresses, and this is exactly what I am looking for! LOVE all of them. I'm thinking long flowing skirts. We are coming into summer here! Honestly Ive been looking at your fabrics for some time now I have 2 wingback chairs Ive started to take apart, sadly my husband and I are going through some tough times. We are both Firefighter/paramedic and we are struggling. I wanted to get your fabric to redo my 2 wingback chairs so at least when we come home we have something bright and cheerful in our house. These patterns will brighten up our days whether it be us coming home from a bad shift at the fire department or when we are stressed out beyond our control over how we will survive day to day. I'm all about positive energy's and right now I need about 15 yards or bright and cheerful happiness in our home. I would have to make a quilt with this. I love the colors you choose! This giveaway bundle inspires me to make a patchwork purse. Such pretty colors. Gorgeous fabrics -I would love to make a quilt and some matching pillows! I really love your fabrics. I would make a hexie quilt using together with other Pat Bravo fabrics. This bundle inspires to me to make either a beautiful quilt for my grand daughter or a big quilted bag with all these fabrics . . . a quilt as you go method & matching wallet, checkbook, fob! What a wonderful gift that would be (for me)! Gorgeous bundle! I LOVE Indie, which I bought as a FQ bundle and made a quilt for my husband and I (not finished yet but I LOVE it). This bundle inspires me to make a quilt for 2 dear friends of mine who have been an amazing support to me and my husband as we have faced some heartache in the last couple years. A quilt from this bundle would look just beautiful in their house. Thank you for inspiring me! I would love to make a modern quilt with these beautiful fabrics! This beautiful bundle of fabric inspires me to make a gorgeous, colorful tote! Thank you for the chance!! Skirts for my little girl! The fabric would make gorgeous bags and throw pillows. Such happy colors. Beautiful collection! I need to make a quilt for my niece whom just graduated from college. Yummy fabrics! I want to make quilted pillow covers to brighten my home! 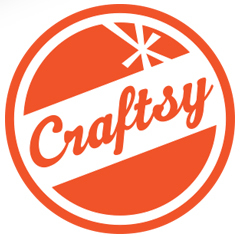 I'm inspired to make a scrappy tote or large purse! Thank you, Pat! A quilt with matching pillow sham for a long winter's nap on the couch! I can see tote bags and maybe a beautiful dress for my little girl then some EPP with every little bit I have left. They are just beautiful. I can see why they inspire you. Triangles. Maybe as a pillow cover with just that beautiful bundle. Or maybe as a mini with some sashing in a low volume neutral for my wall to really let those colors shine! Love the fabrics. Maybe I would make a lap quilt. Not sure what I would make, but definitely something good! These fabrics would inspire me to make some Grandma's Flower Garden pillows. This beautiful ensemble inspires me to finally start diving in to a hexagon tote bag project! Wonderful fabrics! I would like to sew a double clasp purse or a handbag ! I would use these beautiful fabrics for a new bag. The scraps I would put to use in my Tula Pink City Sampler quilt blocks. Thanks for the chance to win. Thanks for this chance to work with your fabrics. I see a patchwork table cloth from these. Very pretty colors. Such happy fabrics! I'd make placemats, one from each fat quarter. They'd look so pretty on the table together! Thank you for the giveaway. I have been seeing a lot of stripped feathers and this would be great for them! A cute dress for my 2.5 year old girl. Such pretty fabrics! I would love to make a quilt with this beautiful fabric! Hi Pat, my grandaughter is 8 months old and following designs on the quilt when we play. I would love to make her a quilt with these FQ and maybe white! These designs and colors are beautiful and meant to be admired! I know she would love it! I have a quilt pattern waiting for a bundle of bright beautiful fabric that would be showcased in this quilt. The center piece in these blocks is large enough to make the fabric shine. Some pretty pillows for the living room. Those colors are all so happy and would pull all the winter blues out of the house. Love them. I am inspired by your fabric to create a round art quilt. The fabric collection would be used as circles of many sizes reverse appliqued into a quiet fabric with a minimal contrast cross hatch design. I would quilt it with intersecting, overlapping circles, I would also use metallic thread in a random manner. My final touches would be the use of various sizes of beads and hand embroidery as embellishments. I see a fun tote bag for my daughter-in-law who just lost everything in a flood. Because I have made soooo many things this year for others I would probably make something like a skirt, throw, or purse for ME! But then again, if an unexpected forgotten birthday came up, I would gift it! I'm seeing some funky market/tote bags for my daughters (and me too, of course!). Thank you for the chance to win. Thanks for this wonderful chance to win! I would make a traditional patchwork style quilt in small squares. I'm constantly making baby quilts using soft colours and small, sweet illustrated prints. It would be a great change to use these delicious saturated colours! So many things but pillows or lap quilt strike me now. Love the bright colors. Thanks for a second chance to win! Beautiful fabric for paper pieced stars. I would love to win this gorgeous fabric to make my quilt. These are beautiful! They remind me of my niece Emily, so I think I would use them either for a tote or throw for her. What fabulous colors! I can see how they inspired the thread collection! They are inspiring me to make a quilt that brightens up dark winter days. Thanks for the giveaway and for your inspiring blog! I would love to make some bags from these cool fabrics! These fabrics inspire me to make a quilt using the carpenter star pattern. I would arrange the pieces to look more as a flower. I know I would have a bloomin' joyous time creating it. This bundle of beautiful fabrics say lap quilt to me! Thanks for the lovely giveaway. I see a Weekender type bag and tote - big ones. The fabrics remind me of the excitement you feel when you are going to see loved ones for a weekend, or going to do something you've really been looking forward to. I see a lovely ruffled pillow! I've been making small handbags for my friends and family. 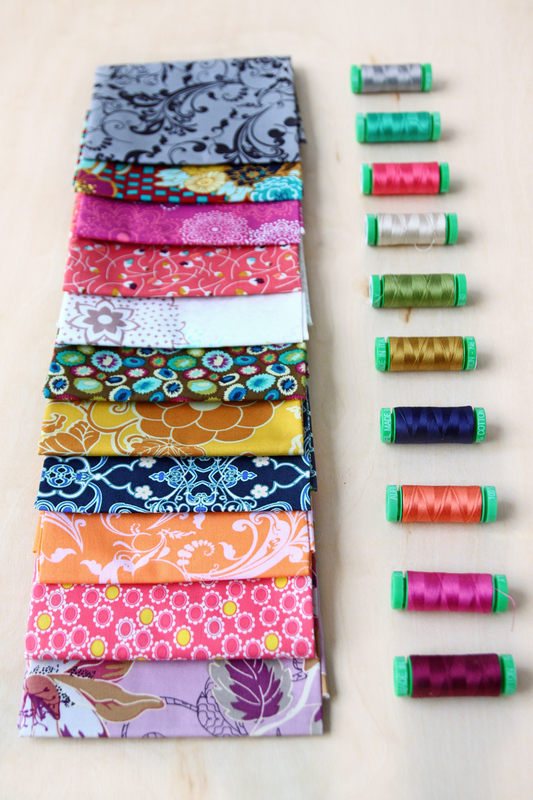 These colorful fabrics will push me out of my comfort zone to create bright, fun bags. I love the colours - I'd make a picnic quilt ready for next summer! They are so beautiful, I would have a hard time cutting into them. I would probably want to make a large block quilt that showed off this bundle of joy or perhaps some swing purses for gifts. Beautiful fabric. Thanks for the giveaway. I would love to use these to make a mini madallion quilt to hang in my living room! Thanks for the chance to win! Only in my wildest dreams would I win this wonderful bundle! I would probably look at it for a LONG time before I dared cut into it- for a quilt I suspect! I see some beautiful totes using these fabrics. Thanks for the chance. Yummy fabrics. I'd like to make a cheerful wallhanging/banner with them. I see some bags or totes with those fabrics! These would make a gorgeous patchwork Weekender! Those fabrics would definitely become a beautiful quilt for my bedroom corner chair where I sit, read, and cuddle up under a warm quilt! I would LOVE to make this into a patchy skirt...but if that didn't workout, I would love to make a lap quilt. I have some Rock 'n Romance that would fit into this bundle I think...Thanks for the chance to win. I LOVE this bundle. 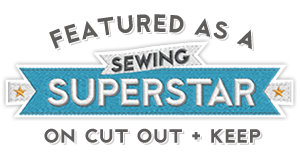 Congrats on the Aurifil thread boxes! Those are SO cool! Wonderful bundle...it inspires me to make a string quilt, playing with patterns and colors of those amazing fabrics! I love bright modern fabrics! These would make beautiful tote bags or a cheerful lap quilt . These are gorgeous!! I am inspired to make notebook covers. I collect notebooks, diaries, sketchbooks etc and I'd love the chance to cover my collections with these gorgeously beautiful fabrics! I might alos make a patchwork skirt....ooo I can see it now!! I would make a table runner or new bag. Love these colors! Love, love, love! I would make a quilt, of course! a bag for me, maybe the Super Tote, or a pillow cover or a table runner... Lots of pretties here! I would love to use these to enter purses into Purse Palooza...thanks for the chance to win! I would love to make some kind of kaleidoscope quilt with those lovely colors. Dreamy!!!! Mmmm picturing a wall hanging or a skirt for my daughter. 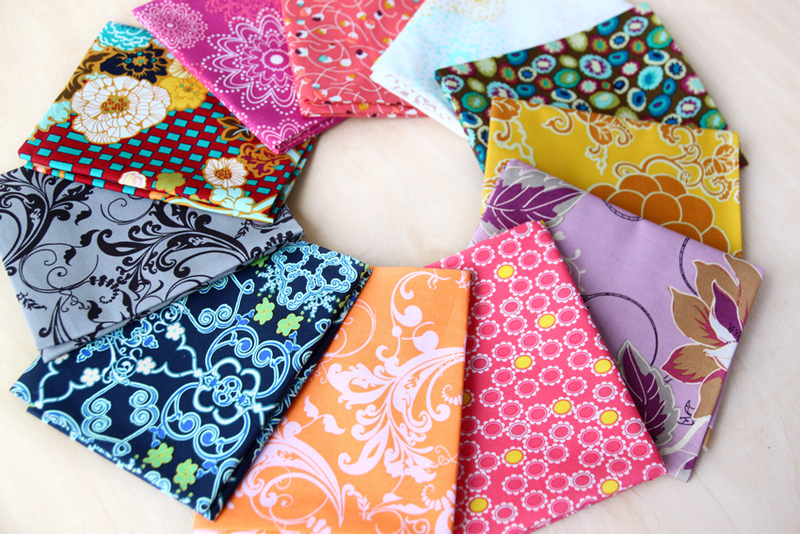 This bundle inspires me to make a beautiful quilt that I just saw in beautiful bright colours. Thanks for the giveaway. I love these prints together. I have never made a tote & think I would make one with these lovely fabrics. This bundle inspires me to make a bunch of cushions for our sofa. Just beautiful! I would make a lovely cushion for my porch swing at our cabin in the mountains! Lovely!!! Would make a beautiful tote! I would love these. Great starter set for a quilt.